Categories: Blog. Tags: Lightroom, London, Training. There are still a few places left on the one-day Lightroom training course we’re running next week. It’s being organised by and held at Four Corners, a centre of all things photographic. We get asked about group courses quite often but don’t often do them so if you’ve been waiting, now really is the time to come along! In this one-day course, I’ll be covering a digital workflow using Lightroom 4 — bring your laptop and follow along with the examples, ask questions and take notes. We’ll be going over the setup of your catalogue, the organisation of your files, the import process, post-processing using the Develop module and exporting in different formats and colour spaces. I’ll be demonstrating using Lightroom 4 but, for any Lightroom 3 users present, will cover areas where the two products differ. The one-day course costs £120 including VAT and is perfect for photographers considering Lightroom or already using it but not as well as they’d like. There’ll be lots of question-and-answer time, too. Above: the pink and yellow-orange highlights in this photograph, shot raw, are preserved in Lightroom 4 with no effort but are almost impossible to recover in Lightroom 3. Dealing with highlights and shadows is one of the topics we’ll be looking at when we cover the Develop module. The booking form is over at the Four Corners Film site — to book your place, click here. Lightroom training day coming. LR 4 beta out. Lightroom 3 on sale! Three topics today in an attempt to make up for nine months’ silence. Important update, April 2012: we’ve moved the date of this course by a week to avoid a date clash: it’s now scheduled for Wednesday, 23rd May 2012. Every week, we get asked about Lightroom training courses for small groups. We now work mostly one-to-one with photographers but Helena and her colleagues at Four Corner are organising a one-day Lightroom course that I’ll be delivering on Wednesday 23rd May, 2012. I’ve taught at Four Corners before and it’s an excellent place; at £120 for the day, including VAT, this course is terrific value. I’ll set you up with a smooth, Lightroom-based workflow and answer your questions. You’ll need to bring your own laptop running Lightroom 4 or Lightroom 3. You can use the 30-day trial of Lightroom if you’re still undecided. Questions? E-mail Helena or e-mail us. It’s old news now but Lightroom 4 public beta 1 is available as a free, fully-functional download, valid till the retail release of Lightroom 4. Back when I last wrote about Lightroom’s closest competitor, Aperture 3, I said that Lightroom’s two weaknesses were the absence of soft proofing and the absence of a book-publishing package. This first public beta addresses both those issues and also makes some thoughtful changes to the Develop module, among other things. A note of caution: Lightroom 4 public beta 1 is not yet ready for production use. It has lots of interesting new features and is good to experiment with but it’s no more than that. We’ll be talking about it on the course but unless it has been released officially by then, we’ll stick with Lightroom 3. When you soft proof, you see your work on your computer’s monitor looking closer to the way it will look in print. That allows you to make adjustments specifically for the print version. Above: image displayed in Lightroom 4 beta. Perhaps because of Lightroom 4 beta’s release or maybe because Aperture is now so affordable, the full retail copy of Lightroom 3 has been reduced to just £95 including VAT and delivery from Amazon. That is at least £100 less than the old street price. Click here to buy from Amazon UK. Hoping to write again in days rather than months. Please call or write if you have questions. Categories: Blog, Training. Tags: Lightroom, London, Training. We’re often asked about Lightroom tuition in central London, rather than at photographers’ own studios, homes or offices. We’re pleased to say that we can now offer exactly that — an afternoon or a day in the very vibrant area around the Old Spitalfields market. It’s very easy to get to — it’s near Liverpool Street Station or Shoreditch High Street stations. Training will be at one of the meeting rooms at The Cube. It’s ideal for Q & A, to go over aspects of your Lightroom-based workflow that you’re unsure of or for a full day’s training. You can bring a laptop with your work on it or we can just use ours. Call 0333 570 5703 for details or, better still, complete our contact form. To get to the form, just click here. 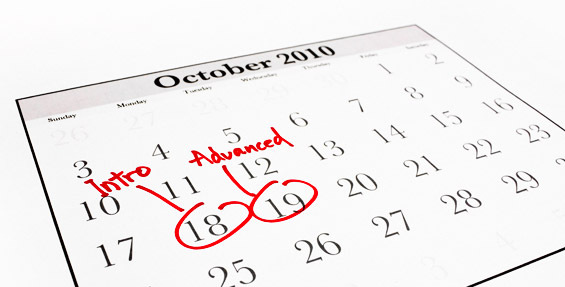 We’re taking bookings for training in November and December (obviously! ), there’s a complete website refresh coming up, we’re going to offer printer profiling soon for your printer/ink combinations and there are new workflow articles on the way. If you’ve arrived here after clicking on a banner ad in the current BJP newsletter and you’re interested in help with your photographic workflow — working faster, getting better results — we’d love to hear from you. Call 0333 570 5703 or complete our contact form by clicking here. We’ll have a discount voucher appearing in the show guide for Vision 10 on Friday, November 19th. It will offer a discounted rate for one-on-on Lightroom training. Look out for it! Categories: Blog. 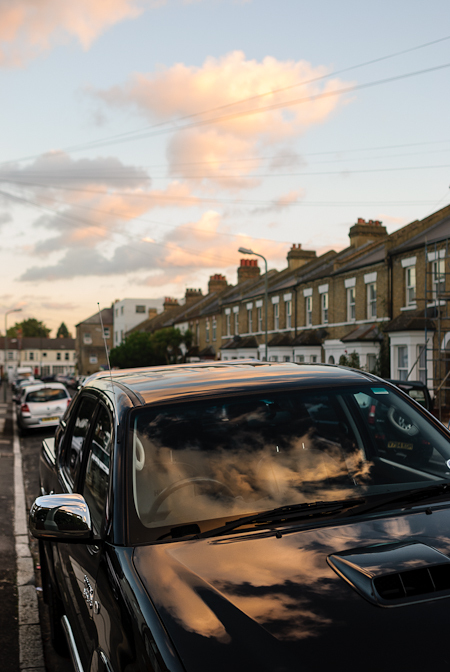 Tags: Beginner, Lightroom, London, Photoshop, Resources, Training. Last updated: Monday, 27th September: booking page is now live. We’re really pleased to be able to offer you training in central London, at last! We’ve had lots of requests for more affordable training and we’ve now found a solution we’re delighted with. We’re bringing to this group training course everything we’ve learned from our successful one-on-one workflow tuition about what photographers find easy and what they find difficult, so we know what to spend a little more time on. We’ll keep updating this post with more details. The training sessions will be held at the seminar room at Jacobs, the famous photographic retailer, on New Oxford Street. They’ll run from 10am to 5:30pm with a break for lunch and short mid-morning and mid-afternoon breaks as well. 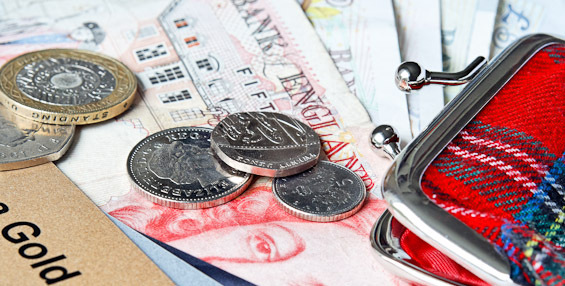 We’ve done everything possible to keep costs low so there are no frills. We’re not training in a computer room so you won’t be needing your laptop—just bring along a pen and notebook (the type with paper in it, not a CPU, Intel or otherwise). The cost covers just the cost of the course. You’ll definitely get more out of the training if you can make it to both days. On the second day, the format will allow question-and-answer time and recap but we’ll also go on to cover more advanced topics; that approach always helps the learning process. However, you’ll be able to book just the first day or (if you just need some questions answered and a little help with more advanced topics) just day two. Again, we’re keeping things as flexible as possible. 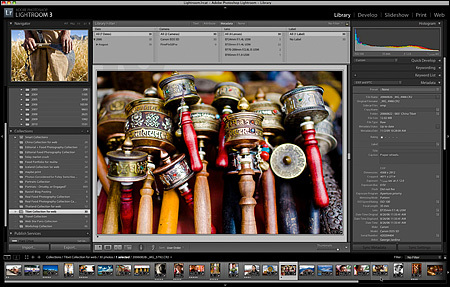 This day will leave you feeling well informed about the complete workflow and about what Lightroom 3 can do for you. Many of the photographers we’ve trained over the last year have been wary of at least one aspect or another—this first day of training is where you leave behind that uncertainty and learn the power of every part of the application; it builds knowledge and confidence. Setup, preferences, importing, filing strategy, keywording, collections, development, filtering, export for web, printing… this day will be a thorough introduction to a workflow based on Lightroom 3. More detail on day two and a more open format, with lots more time for questions. We’ll be looking at some essential third-party plugins and providing recommendations, we’ll go into detail about the various ways in which you can combine your Lightroom workflow with Photoshop and we’ll talk about creating your own presets to speed up every aspect of your Lightroom workflow (import, development, local adjustments and export). We’ll cover local corrections in more depth. You and the other attendees will lead the Q & A. Again, check back later for details. Get all your Lightroom questions ready and bring them with you on Tuesday—you’ll get plenty of time to ask them and get them answered in detail. You can able to pay with PayPal (which accepts credit cards, if you have no PayPal account) or by bank transfer (contact us for details) or by cheque. You willll get a full VAT invoice. Big photographic retailer in London with an excellent reputation and keen prices. The course will be held downstairs in the seminar room in the Professional Services department. Jacobs have been very accommodating in our dealings with them and we can highly recommend them. You’ll find an excellent stock of cameras and lenses (new and used) and a wide range of accessories at very keen prices. Just visit the booking page here. If you know people who might be interested in this offer, please pass on our details and tell them to check later in the week. Fire away—send e-mail, leave a comment or give us a call: 0333 577 5703. For updates, check back here or subscribe to the blog by e-mail or RSS/Atom. Categories: Blog. Tags: Book, Lightroom, Links, London, Manchester, News, Recommended, Resources, Training, Tutorial, Workshop. 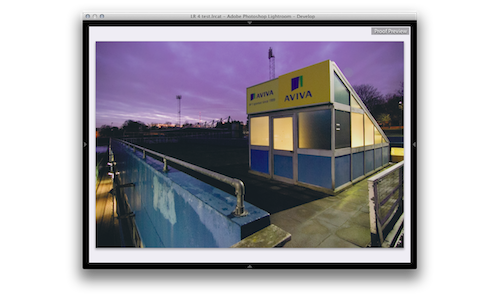 We often get enquiries about a less costly alternative to our one-on-one Lightroom training courses. Here are some ideas. Back when Lightroom was new, George Jardine produced an excellent podcast of related interviews and discussions that offered great insight into the product and some very useful video tutorials from George himself. The podcast also involved the Lightroom team, world class photographers and master printers who used the product and who were involved with its development. George’s new video tutorial for Lightroom 3 doesn’t cover the Develop module—this one is all about workflow. The reviews are really good and, having listened to and enjoyed every single episode of that early Lightroom podcast back at the time of the first public betas and Lightroom 1, we can highly recommend George’s knowledge and his approach. Take a look at the free sample video and see what you think of his style. Some important notes: you can only watch these videos online (you don’t download them), there are separate links for the iOS versions (iPad/iPhone/iPod Touch) and you’ll need to make sure you’re up-to-date with your Flash browser plugin for Windows or the Mac. 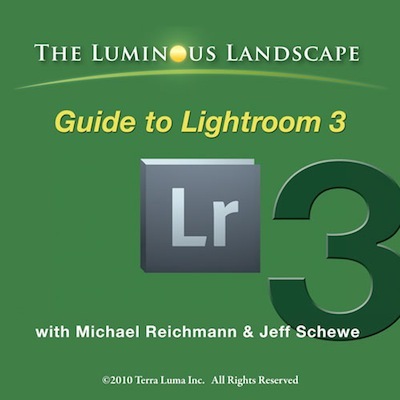 Michael Reichmann and Jeff Schewe are back with a completely new course covering Lightroom 3. In total, there will be more than nine hours of material for download; at the time of writing (Aug 2010), the footage has been shot but is still being edited so that when you buy, you get access to as many episodes as are online, with the rest available for download as they appear (with nothing further to pay, obviously). A 10% discount is available while material is still being edited and uploaded. For more about Jeff and Michael, see our original post about their Lightroom 2 videos. These guys really do know both photography and Lightroom and even at full price ($49.99—currently about £32), the course is great value. The 10% discount takes the cost below £30. If you own their Lightroom 2 tutorial, you get a further 10% discount on this new release. You need to obtain your discount code—full details are on the product page. Again, there’s an online sample and a table of contents in the form of a PDF here. 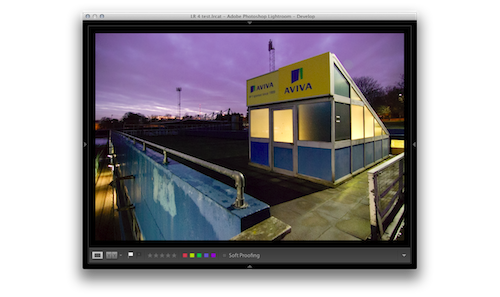 We always leave photographers with a book to accompany our own one-to-one Lightroom tutorials. After experimenting with a few very good titles, we’ve pretty much settled on two: Scott Kelby’s and Martin Evening’s. We’d recommend them to anyone interested in mastering Lightroom 3. The general standard of Lightroom books is pleasingly high now so there are good alternatives but we’d be comfortable describing these two as the best Lightroom 3 books on offer right now. 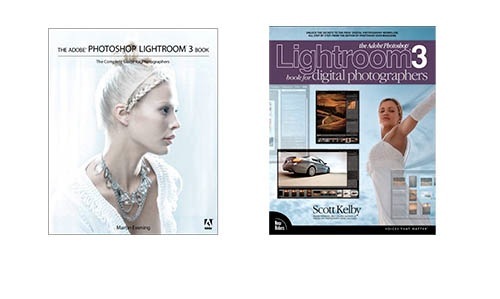 Of the two, the Kelby (full title: The Adobe Photoshop Lightroom 3 Book for Digital Photographers) initially seems lighter in tone but its jollity disguises Scott’s knack for delivering a lot of information in a very effective way. As with photography, making your writing seem effortless and breezy is very hard work but he does it. Martin Evening’s alternative (The Adobe Photoshop Lightroom 3 Book: The Complete Guide for Photographers) is perhaps suited to the more technically minded. Both books, however, are excellent. In the UK, you generally get the best prices at Amazon (click here for Scott Kelby’s book and here for Martin Evening’s ) but you can also find them books at larger bookshops. For Londoners, Foyles in Charing Cross Road generally keeps stock of both. Both are available for Kindle (Evening , Kelby ) but we haven’t tried them in that format so can’t comment on readability. We have no personal experience of Jerry Courvoisier’s training but he’s delivering two Lightroom workshops in the UK in November 2010 and we mention them here because George Jardine (ex-Adobe, see above) is giving the same workshops for the same company in different parts of the world. No guarantee but perhaps that’s a benchmark and says something good about the company’s standards. As you can see from the linked page, there’s a two-day workshop provisionally scheduled for London on the week-end of 6th/7th November 2010 and and another for Manchester a week later, on 13th/14th November 2010. You can’t book yet but keep an eye on the page and the links should appear shortly. If you’ve tried one or more of the above and are interested in shorter tuition sessions to tie up any loose ends, we’d be happy to hear from you. We’re considering a new idea that might also fit in here: short, one-to-one remote training sessions, using the secure screen-control software that we’ve been using for years to provide support to our customers. The idea is that, for 30 minutes or an hour, we help with specific aspects of your workflow that you would like us to address. We can see your screen and your mouse pointer and can even take control of the computer to demonstrate things, then watch as you work. It’s not a substitute for a day of face-to-face training but is intended to quickly address specific questions, at a low cost. It’s a technique we’ve used for over three years to provide support and has worked very well. We offer discounts to amateur photographers, whether or not they intend to go professional. You might remember our March deal. Interest from amateurs wasn’t enough for us to maintain those prices (the idea was to go for volume without an ongoing sales and marketing effort) but we do have a one-day offer for those of you not making money from photography yet—just drop us a line for details. When we hear from you, it would be useful for us to know which aspects of your workflow are currently holding you back, what camera and computer systems you use, what type or types of photography you do and roughly where you live. Unrelated to saving money on Lightroom training is the news that the Lightroom 3.2 release candidate is out, with bug fixes, support for recent cameras (including the Panasonic Lumix LX-5 and the Sony NEX-3 and NEX-5) and automatic correction for more lenses. A release candidate (RC) is a build that is feature complete, has gone through the beta-testing process and is now being made available for a final, public test intended to reveal any show-stopping bugs. 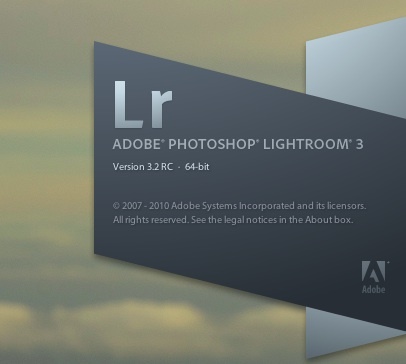 Because this is an RC release, it won’t replace your existing copy of Lightroom 3 (or Lightroom 2)—it sits by its side. Read more and download it here. You might have seen us over the last few months in the business directory of the British Journal of Photography (BJP) after its successful, industry-defying transformation into a heavy, top-tier monthly. 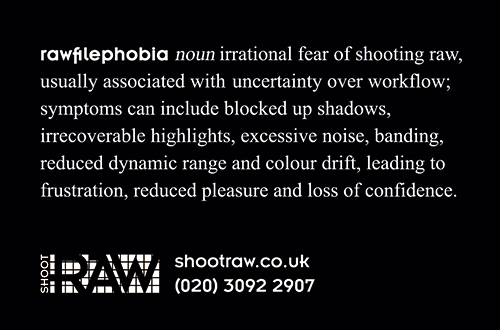 Below: the advert we’re running in another favourite, Photo Pro magazine. You can e-mail us or complete a more detailed contact form. © 2009-2018 Shoot Raw. All rights reserved. Shoot Raw is a trading name of Paraling Limited, registered in England and Wales. Company number: 06164871. VAT number: GB919245118. Registered address: Suite 2033 Letraset Building, Wotton Road, Kingsnorth Industrial Estate, Ashford, TN23 6LN.